The stylish yet durable Casio Men’s GW-9400-1CR is considered by us the best model from Casio’s “Master of G” range. Master of G watches are designed to meet the demands of some of the more challenging environments on earth, and work to remain resilient by employing a variety of high-tech durability features. 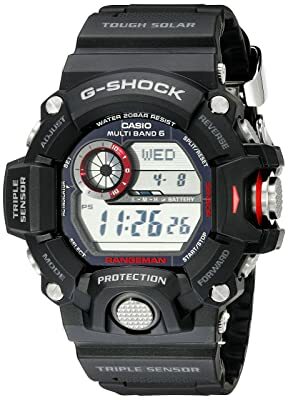 G-Shock watches are rugged in design, as Casio have spent years imrpoving their techniques in shock-resistance. The black resin-rubber casing and band provide a protective shell which Casio test can endure a 10-meter drop. A crease-shaping and forge-molding process increase the flexibility of the casing, improving comfort and durability. As is standard with most shock-resistant watches, the mechanisms inside the watch are loaded with springs, providing a suspension which protects moving parts from taking damage. The Casio Men’s GW-9400-1CR watch’s screen is also damage-resistant, featuring a hardened mineral crystal display. The mineral crystal is composed of several elements, which have been heat-treated to create unusually high durability for a transparent material. The dual screen design of this watch’s display enables the user to access a multitude of data without ever having to press a button. The larger display can show both time and directional data, while the smaller display can be programmed to show a variety of information such as moon charts and data regarding sunrise and sunset times. The digital compass system in this watch has a bearing memory function which allows the user to store their measured direction and maintain their course towards a target when visibility is low. The GW-9400-1CR has an asymmetrical or “frogman” design, which means that the strap is located on the right-hand side of the watch case. The purpose of this is to create a more comfortable and solid contact between the strap and the wrist, reducing the risk of twisting, and securing the position of the watch. This watch employs a large button design for easy access to the watch’s instruments and sensors. A substance called urethane is used to provide independent protection for each button, vastly reducing the risk of dust or water damage to moving parts. Extending through the center of the case is a strong center shaft which creates a strong and stable axis for the purpose of durability. The Riseman’s key function, measurement functions, and pressure sensor are all placed at opposite ends on the case, contributing to the durability and ease of use of this watch. This watch’s array of sensors are mounted inside the casing, protecting them from damage. In some environments, magnetic disturbances may cause errors in the measurement taking of certain instruments. In order to combat this phenomenon, Casio has used an anti-magnetic 64 titanium alloy to house the sensors, the button shaft, the case backing, and the compass bezel. We consider this watch to be the best mid-range military watch around. The GW-9400-1CR “Master of G” is well equipped with an array of features that should give you confidence in new environments. It’s also nice to know that the solar-powered battery (if kept charged) will not suddenly go out when you need it most. The Casio men’s GW-9400-1CR “Master of G” is our pick as the best military/tactical watch due to its inclusive range of features and all together brilliant design. I’ve been using G-Shock watches for years, but this one really goes above and beyond. It really brings together all things which are great about Casio: durability, reliability and technology. I highly recommend.